gem, one of the Spanish novels of the 1920s that received the highest public and critical praise in its times, curiously and unjustly forgotten by critics later on. 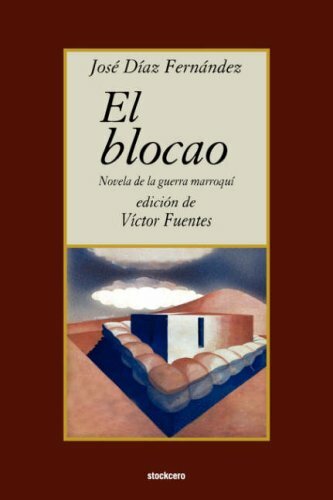 Often categorized as a pacifist novel, much in vogue after the First World War, in El blocao Jose Diaz Fernandez, deeply involved in Modernist-Vanguardist aesthetics, emphasizes Futurism's destructive momentum and reveals how the absence of conventional components of novels -detailed descriptions, plots, chronological development and psychological analyses of the characters- does not hamper the possibility of sharing with the reader the most vivid experiential originalities in the seven fragments that constitute the text. The result is high quality futuristic literature, beautifully crafted by combining the achievements of the artistic and the political vanguard movements. Not surprisingly, Jose Diaz Fernandez' works have been reevaluated in recent years, and his three novels, El blocao (1928), La Venus mecanica (1929), Octubre rojo en Asturias (1935), and his books of essays, El nuevo romanticismo (1930) are now viewed as some of the outstandingly original and distinguished texts of Spanish literature of the 1920s and 30s. In this edition, which follows the text of the 1928 edition, Professor Victor Fuentes has augmented his previous edition (Madrid: Ediciones Turner, 1976, 2 ed.) with a corpus of notes which will facilitate comprehension of the book by present-day readers, and a prologue which includes a fuller discussion of aesthetic and ideological parameters.